The problem: bear has lost his hat, and he wants it back. The suspect(s): it could be any of his his forest friends. Join bear as he asks all his forest friends if they have seen his hat. he is just so sad. told. It's hilarious and I get deep belly laughs every time I read it. 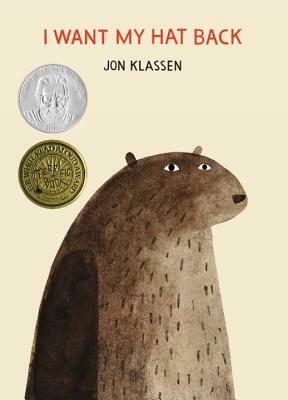 Jon Klassen received the 2010 Canadian Governor General’s Award for his illustrations in Caroline Stutson’s CAT’S NIGHT OUT. He also created illustrations for the popular series THE INCORRIGIBLE CHILDREN OF ASHTON PLACE and served as an illustrator on the animated feature film Coraline. I WANT MY HAT BACK is the first book he has both written and illustrated. Originally from Niagara Falls, Canada, he lives in Los Angeles. Deliberately understated, with delectable results… Skillful characterizations; though they're simply drawn and have little to say, each animal emerges fully realized. Klassen's animation and design skills are evident on every page in this sly, subversive tale... Adults and older children will chuckle mordantly at rabbit's sudden disappearance, while young children might actually wonder, with Squirrel, where the rabbit has gone. A sly picture book...Young readers and listeners will love being in on the joke, making them appreciate the story's humor even more. This is a familiar picture-book formula with a twist, and the minimalist style Klassen employs with both text and art only emphasizes the humor of the situation....While these design choices and the simplicity and pattern of the text would make this a good choice for beginning readers, it would also make an amusing readaloud or a great little readers’ theater piece.